This baby cap matches the Picot Sleep Sack. 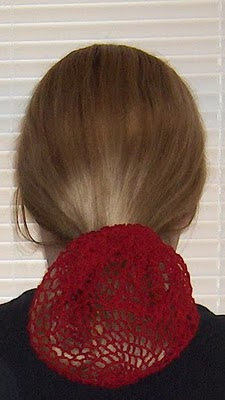 Small Picot Cast On: Make a slip-knot and place it on your left needle. Knit a st into the slipknot, leaving the slipknot on the needle. Place the new st onto left needle by inserting the left needle into the front of the new st. Continue in this way to CO 5 sts, then bind off 1 st, leaving 4 sts. Continue to CO 5 sts and bind off 1 until 60 sts are on needle. Small Picot Bind Off: Knit a st into the next st. Place the new st onto left needle by inserting the left needle into the front of the new st. Bind off 5 sts. Continue to CO 1 st and bind off 5 sts until all 60 sts are bound off. With 16" needle, small picot cast on 60 sts. Join and work in the round. Knit until cap measures 6 inches from cast on edge. Round 11-12: K1, P1. Repeat around. Leaving a 5 inch tail, using an I hook chain 60. Fasten off leaving a 5 inch tail. Cut a 10 inch length of yarn, fold in half, pull loop through the end of the drawstring. Pull all the ends through the loop and pull tight forming a tassel. Weave drawstring in and out of the eyelets created in round 10. Pull to close and tie bow. 1. Sleep sack in photo was knit using Red Heart Super Saver in Orchid. 2. The portion of the sleep sack after round 5 and before round 6 is a blank canvas. Use whatever stitch pattern you like. The one in the photo is done in stockinet. Round 11-14: K1, P1. Repeat around. Leaving a 5 inch tail, using an I hook chain 100. Slipstitch in the back bump of the 2nd chain from hook and each remaining chain. Cut a 10 inch length of yarn, fold in half, pull loop through the end of the drawstring with the tails. Pull all the ends through the loop and pull tight forming a tassel. Cut two 10 inch lengths of yarn, fold in half, pull loops through the opposite end of the drawstring and pull tight. Thank you Jo NY for testing this pattern and allowing the use of your photos. 2. Pull the joining slipstitches tight. 3. 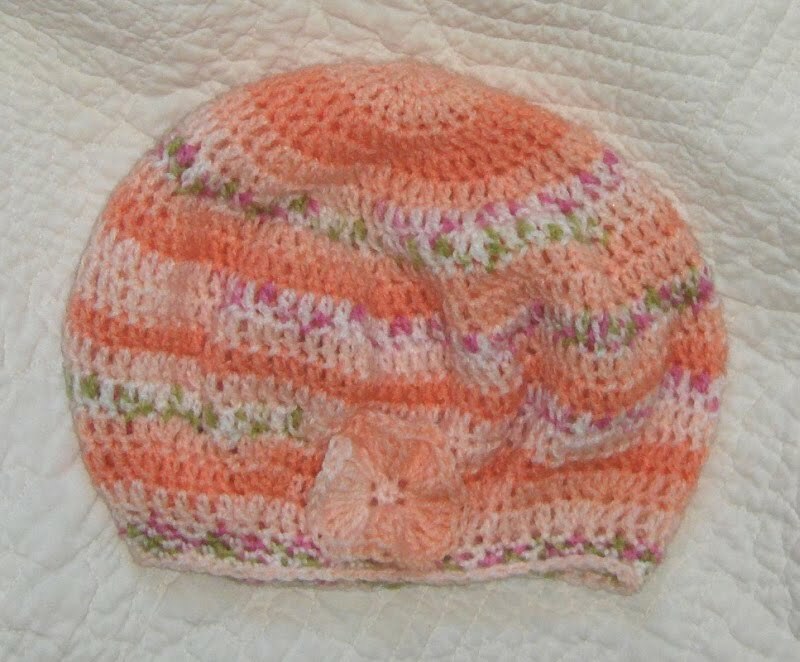 Beret in photos was crocheted by Jo NY using Beret Baby Jacquards in Orange Blossom. Beret should measure approximately 13 inches. Rounds 18-19: Ch 1, sc in each stitch around. (60 sc). Rounds 20-22: Ch 1, sc in each stitch around. (60 sc). Fasten off and use tails to sew flower to cuff of beret. Beret should measure approximately 12 inches. Rounds 17-18: Ch 1, sc in each stitch around. (54 sc). Rounds 19-21: Ch 1, sc in each stitch around. (54 sc). It is blueberry season in NW Washington. So how better to celebrate the season than with a Blueberries Cap? 1. Read all instruction through before beginning cap. 3. Work is all done from the wrong side until the cuff. 4. Only turn when instructions tell you to. 5. Pull slipstitches tight, you want them to almost disappear. Repeat rounds 10 and 11 until you have a total of 20 (22, 24) rounds, ending with round 10. ROUND 2: Ch 2, *BPHDC around next hdc, FPHDC around next hdc. Repeat from * around. Join with a slipstitch, as if to front post, around the beginning ch 2. DO NOT turn. ROUNDS 3-4: Ch 2, *BPHDC around the BPHDC, FPHDC around the FPHDC. Repeat from * around. Join with a slipstitch, as if to front post, around the beginning ch 2.